Here at Wisetiger we work with a number of clients in the university student sector including CRM Students, Gradpad, CastleHill and Empiric Student Properties. Our work in this sector is focussed on increasing engagement and conversion of website visitors into student accommodation bookings. We’ve got a great track record of delivering successful digital marketing to students, so when we saw a survey of how students are using the web on smartphones we decided to share it with you. The study was carried out by the Interactive Advertising Bureau (IAB) and Qriously into US College students’ views of mobile media. The study involved more than 2,000 people and focussed on 17-19 year olds, comparing their use of the web to the general population. 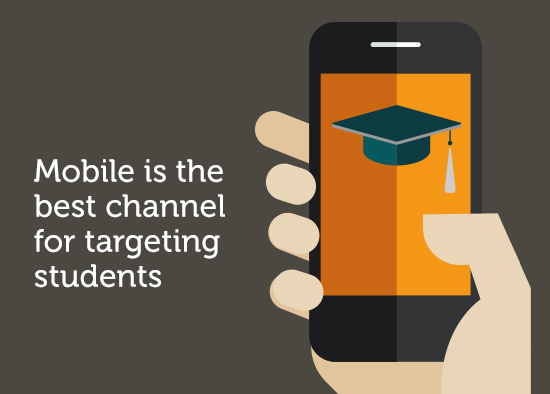 Students are most likely to engage with advertising and marketing on a mobile device, with TV coming second. Print, radio, desktop and tablet were much less engaging for students. Students are more likely than the general population to do something when they see advertising and marketing on their phones – click throughs and sharing were common with this group. Students are more likely to engage with content tailored specifically to them. Male and female students behave differently. Male students are more trusting of advertising on mobile devices than women, though women are more likely to engage with mobile advertising. Female students are more likely to notice relevant and personalised content than their male counterparts. 73% of students said they were likely to buy products or services from their phones. Social media plays an important role when students are making buying decisions. Smartphones are indispensable for students. When asked if they could only keep one device 50% said their phone with laptops (20%) in second place. The study shows that mobile is the best platform for reaching college students, especially for male students who are traditionally quite hard to reach. Relevant content on phones needs to be given the highest priority as well as good integration with social media. College students are more likely to make purchases on their phones than the general population, so engagement and strong calls to action need to be considered carefully too. For more information about this study visit the IAB website. For more information about marketing to the student sector and driving successful engagement on your website please talk to Wisetiger on 01252 731330 or email hello@wisetiger.co.uk.